Came back to heartbreaking news -- the death of author-illustrator Grace Lin's husband, Robert Salvatore Mercer. Robert and Grace founded Robert's Snow, auctioning off snowflakes created by children's book illustrators, in a valiant, on-going fight against the C-word. We can join their battle and show our support by sending a donation, in Robert’s name, to the Dana-Farber Cancer Institute and the Jimmy Fund. Make a check out to "Robert's Snow," and send it to Lauren Nash, 10 Brookline Place West, 6th Floor, Brookline, MA 02445-7226. Peace be with you forever, Robert, and with your amazing Grace. 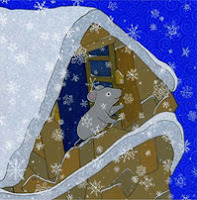 Illustration by Grace Lin from Robert's Snow, Viking Books, 2004.